A stock option is the right to buy a specified number of shares in a company at a given price, called the exercise price. Typically, companies award stock options to senior executives in large quantities, with the exercise price set to whatever the market price is at the time the option is granted. This gives the executives an incentive to make decisions that will cause the share price to rise. If the shares do go up, the executive can profit by exercising the option, buying the shares at the exercise price and effectively pocketing the difference. This is intended to align the interests of the executives with the interests of shareholders. Note that stock options do nothing to align the interests of executives with what is good for other stakeholders, or society in general, or the planet. Stock options come in two varieties. The "European" variety has a single exercise date. On June 30, 2020, for instance, the executive will have the option to purchase stock at $15 per share. Because shares go up and down in value all the time, there is no way to know in advance if the shares will be up or down on June 30, 2020. The "American" variety of stock options allows the executive to exercise the option anytime during a range of dates. This means that the executive can wait until a day when the stock price is up. The more volatile the stock price, the more valuable this kind of option is because the ability to pick the exercise date can have a huge effect on the value realized by the executive when the option is exercised. Think about that. Stock options are more valuable if the stock price is volatile. Stock options therefore implicitly encourage senior executives to take risks that make the stock price fluctuate wildly. They encourage executives to swing for home runs rather than singles. Typically, stock options cannot be exercised immediately after they are awarded, The options only become "vested" with the executive over time. For instance, 25% of the stock options granted to executives of the Walt Disney Company in 2015 will become vested each year for four years. This rewards the executive for staying with the company. Once stock options become vested, they can be either exercised (the executive uses them to buy shares) or sold (the executive sells the options to someone else, who can then exercise them or re-sell them). Regardless of who owns the option when it is exercised, the company must either issue new shares to the option holder, or purchase existing shares at the market price and then sell them to the option holder at the exercise price. This means that issuing options is costly to companies. It commits them to some level of expenditure down the road, either through the dilution or purchase of shares. If the company purchases the shares on the stock market, the cost is obvious. It's the price of the shares they bought, minus the exercise price they receive from the option holder. If the company simply issues new shares, instead, then the cost is borne by the other shareholders. They see the percentage of shares they own go down. The cost is also borne by the company as an opportunity cost, because the company will have forgone the money it could have raised by issuing the shares to the stock market. Many companies that issue stock options do both of these things at the same time. That is, they issue new shares to satisfy the option, and they have a share-buyback program in place to offset the dilution. Regardless of the arrangement, it is clear that issuing stock options is costly to a company. 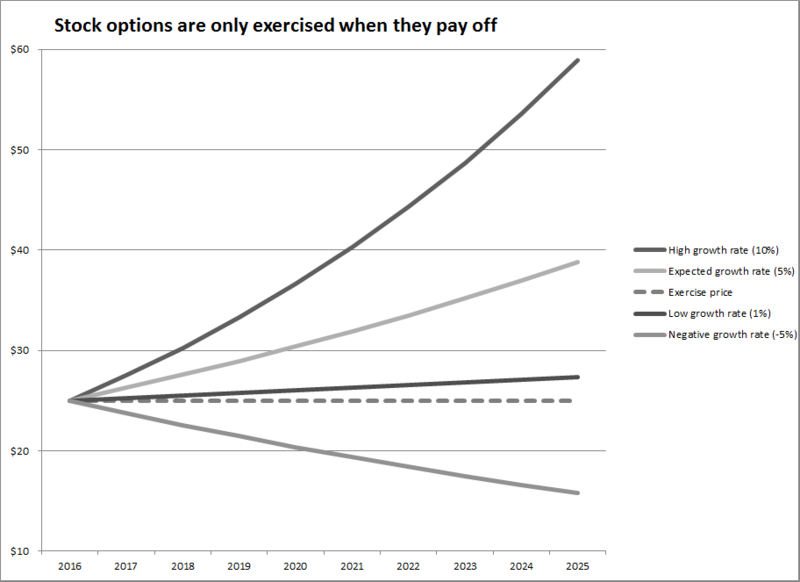 If the share price does not rise higher than the exercise price, the option holder isn't going to exercise the option. This means that the option holder can benefit if the price goes up, but does not pay if the price goes down. All that happens is that the opportunity to profit by exercising the option is lost. Typically, however, the share price will rise, as shares tend to do. This means that, statistically, it is likely that the option will be exercised. From an accounting point of view, therefore, the company is assumed to have incurred a cost in issuing the option. Fair value accounting requires companies to report the cost of stock options in the year in which they are awarded. International and US accounting regulations have sometimes differed on how this cost must be disclosed, and on when this cost should be recognized as an expense on the income statement. Both, however, base the cost of stock options on probablistic models of when the options will likely be exercised and what the stock price might be. In the chart above, we can see that when options are issued at an exercise price of $25 per share in 2016, it is possible that the shares will go down in value. That's the "negative growth rate" line at the bottom. If this is what the share prices do, the executive who received the option is going to do nothing and gain nothing. However, it is possible that the share prices will not only rise as expected (the second line from the top) but rise rapidly (the top line). This can indeed happen if the company receives wonderful leadership from its senior executives. But it can also happen if the stock market as a whole takes off, regardless of the company's own financial performance. The upshot of this is that the expense recorded by the company when it issues the options (based on expected price) has the potential to be far, far less than the value gained by the employee when the option is actually exercised. For more on this, see my next posting. Photo of European brickwork taken in Naarden, Netherlands, in 2012. Photos of ivy on North American brickwork taken in Kingston, Ontario in 2016. All text © 2016-2017 Cameron Graham, except quotations as cited. All images © 2001-2017 Cameron Graham, except those otherwise credited.